Give your little lady a powerfully beautiful start with a name inspired by true royalty. Some might consider traditional royal names old-fashioned, but they're always represented on the popular baby name lists along with trendy new variations. The British Monarchy has gained fame throughout history as the epitome of modern-day royalty. Many women of the British Monarchy have carried titles that have made a big impact on the world. These names tend to sound serious and convey intelligence and elegance. First names of Spanish queens, princesses, and duchesses typically, but not always, end in "a." If you're looking for a more exotic-sounding name that isn't too difficult to pronounce or spell, these might do the trick. The Japanese royal family is also known as the Imperial Family and carries strict guidelines for women. These selections easily roll of the tongue. Some sound more like a nickname than a given name. Fictional royal women can be found in all types of books, movies, television shows, and video games. Check out the book or movie featuring the name you like most to see if the character's personality adds meaning to your little girl's moniker. 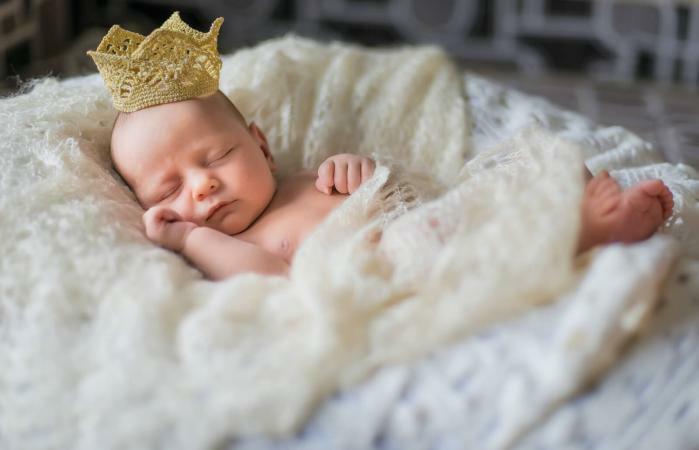 For a modern take on royal baby names, opt for a word related to royalty as your baby's name. You won't hear unique baby girl names like these everywhere, but having an uncommon name gives your daughter a chance to show off her individuality. Queenie A modern take on "Queen"
Royal baby girl names sound elegant and come with the expectation that she'll be beautiful and beloved. Comb through history books from your favorite country to find more regal name options. If your princess has a male sibiling, you can pair her name with a royal boy's baby name.